This is a change for the better, one that we have proposed and supported elsewhere. Why? We believe that in order to support parents choosing a school, league tables need to be functional, relevant and comprehensible. The last of these is straightforward (though not all league table measures in the past have been comprehensible: Contextualised Value-Added (CVA) being the perfect example). ‘Relevant’ means that a measure has some relevance to the family’s specific child. A simple school average, such as the standard whole-cohort % 5 A* to C, is not very informative about how one specific pupil is likely to get on there. By ‘functional’ we mean a measure that does actually help a family to predict the likely GCSE attainment of their child in different schools. If a measure is not functional it should not be published at all. The new group-specific component is comprehensible and is more relevant than the whole-cohort %5 A* to C measure. In our analysis of functionality, we show that it is as good as the standard measure, and much better than CVA. It also addresses in a very straightforward way the critique of the standard league tables that they simply reflect the ability of the intake into schools, and not the effectiveness of the school. By reporting the attainment of specific groups of students of given ability, this measure automatically corrects for prior attainment, and in a very transparent way. This is therefore much more informative to parents about the likely outcome for their own children than a simple average. This of course is what value-added measures are meant to do, but they have never really become popular, and as we show they are not very functional. However, the details of the new measure now published are problematic in one way. The choice of groups is important. We defined groups by quite narrow ten percentile bands, the low attaining group lying between the 20th and 30th percentiles in the KS2 distribution, the high attaining group between the 70th and 80th percentiles, and the middle group between the 45th to 55th percentiles. While clearly there is still variation in student ability within each band, it is second order and the main differences between schools in performance for any group will come from variation in schools’ teaching effectiveness. However, the DfE has chosen much broader bands, and have defined the groups so that they cover the entire pupil population: the low attaining group are students below the expected level (Level 4) in the KS2 tests; the middle attaining are those at the expected level, and the high attaining group comprises students above the expected level. This has one significant disadvantage, set out in detail by Rebecca Allen here. The middle group contains around 45% of all pupils, and so there is very significant variation in average ability within that group across schools. This in turn means that differences in league table performance between schools will reflect differences in intake as well as effectiveness, even within the group, thus partly undermining the aim of group-specific reports. 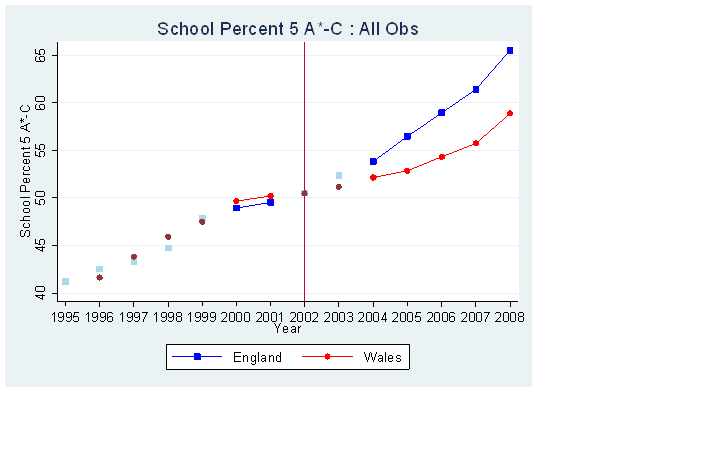 The chart below illustrates this for the middle attainment group (see here for more details). 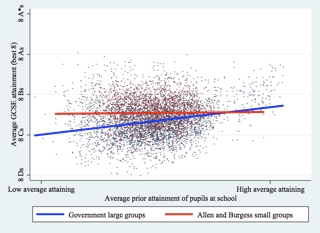 Each of the three thousand or so tiny blue dots shows the capped GCSE attainment for a group of mid-attaining pupils (on the DfE’s measure of achieving at the expected level at KS2) against the average KS2 score (i.e. prior attainment) of pupils at the school. The red dots plot the same relationship for our narrow group of middle attainers (the 45th to the 55th percentile). The chart shows very clearly that the performance among our narrow band is essentially unrelated to prior attainment, but the DfE measure for the very broad group does still favour schools with higher prior ability pupils. We can speculate as to why the DfE chose to have much broader groups. There may be statistical reasons, pragmatic reasons or what can be termed “look and feel” reasons. Using narrow KS2 bands will correctly identify the effectiveness of the school, but will almost always be averaging over a small number of students. So the estimates will tend to be “noisy”, and induce more variation from year to year than averaging over bigger groups. The trade-off here is then between a noisy measure of something very useful against a more stable measure of something less useful. Our original measure was intended to balance these, the DfE have gone all the way to the latter. A pragmatic reason is that some schools may not have any pupils in a particular narrow percentile band of the KS2 distribution. The narrower the band the more likely this is to be true. This would mean either null entries in the league tables, which might be confusing, or some complex statistical imputation procedure, which might be more confusing. The broad groups that cover the entire pupil population are likely to have very few null entries. Finally, the broad groups feel more ‘inclusive’, they report the performance of all of a school’s students. This is a red herring – the point of the tables is to inform parents in choosing a school, not to generate warm glows. The new measures hold out the promise of improvements in two areas: choices by parents and behaviour by schools. Parents will have better information on the likely academic attainment of their child in a range of schools. Second, parents will be able to see more directly whether school choice actually matters a great deal for them: whether there are worthwhile differences in attainment within the ability group of their child. The key point for schools is that performance measures have consequences for behaviour. If this new measure is widely used, it will give schools more of an incentive to focus across the ability distribution. It is still the %5 A* – C measure that is the focus of attention for each group, but now schools will have to pay attention to improving this metric for high and low ability groups as well as simply the marginal children with the highest chance of getting that crucial fifth C grade. If one believes that gaming and focussing of resources within schools is a very big deal (and there is little quantitative evidence either way) then the new measures could have a major impact on such behaviour. Even if such resource focussing is second order, performance measures send signals on what is valued. These new league table measures will explicitly draw widespread media and public attention to the performance of low- and high-ability children in every school in England.